Source: Journal of Fluorine Chemistry [Published ahead of print] | July 26th, 2018 | By Aaron Barry, AndrewBergeron, Tim Stoddard et al. The fluoride volatility technique was successfully applied to irradiated thoria fuel. Uranium was removed from irradiated thoria fuel, with longer fluorination times resulting in greater uranium removal for tests up to 24?h. Some fission products with volatile fluorides were also removed. Fluoride volatility experiments were completed on irradiated thoria fuel in a hot cell facility at Canadian Nuclear Laboratories (CNL). 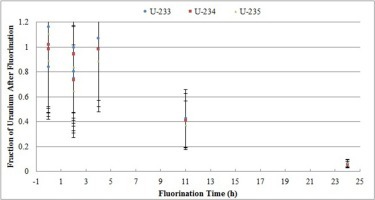 Uranium was removed from irradiated thoria fuel in significant quantities, with longer fluorination times resulting in greater uranium removal for tests up to 24?h. 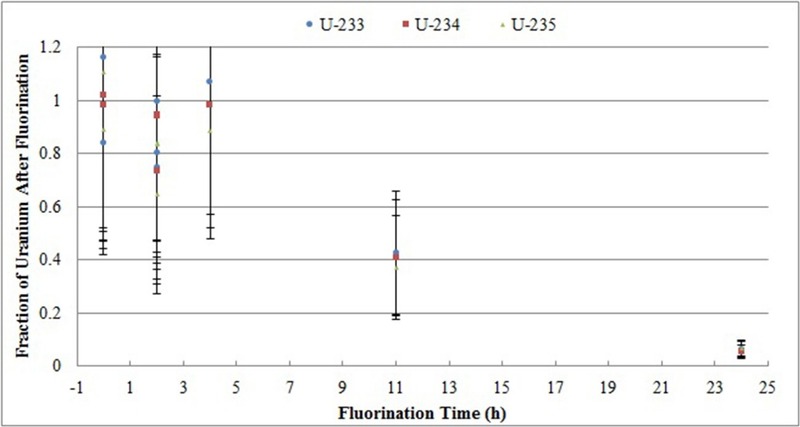 Some fission products were also removed via fluorination; fission products with fluorides having low boiling points (Mo and Ru) were removed in greater quantities than fission products with fluorides having higher boiling points (Zr and Rh).